Just flew in the house while doors and windows were open. Caught with bare hands and released outside. Hey that was a good rescue. Nice picture too. The hummingbird looks like he is your pet but we know better.I hear there is a law against keeping hummingbirds as pets. It's called the Migratory Bird Act or something like that. Anyway, who would do that.They should be outside and they need to migrate. Dr. J feeders. They are the best. I am lazy I guess but love that you can just put them in the dishwasher. I understand that it is really important to clean your feeders. If you don't clean them , you shouldn't have hummers at all. So they came out with an easy way to clean them and that's for me.I agree that these hummers are delicate. So cleaning the feeders is a kind of rescue too I guess. We can put up feeders and then neglect them and harm the birds. That's as bad as just leaving them to harm. So you think like I do. We need to protect the hummers. That was a good rescue. I would have done the same thing. You took a pic and now have the memory. I rescued a hummer in my garage a few years ago. You have to do it because they won't live long if you don't.I am more careful about leaving the garage door open now. I have a couple of kids. It was excitement for them though.Now they seem to notice the little guys all the time and seem to get excited when they see them. I try to teach them about respecting nature. I think this was one of the best experiences for them. They now understand that nature is fragile too. My oldest daughter wants to do a science report about hummingbirds this year. I am going to show her this website. It seems to have a lot of information. I see that they have a Kids poetry writing contest. My girls are into that.Well, good job with the rescue. I live in Vermont and hear that Nova Scotia is beautiful. Hummingbirds make it even more beautiful. I love them. I plant Bee Balm in my garden. Boy, do the hummingbirds love it. I can't imagine having one land in my house. You are so brave to rescue it. My goodness. What a funny photograph. 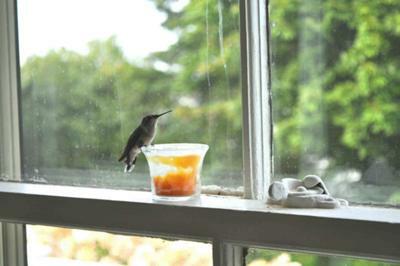 It looks as tough the hummingbird is content to stay right inside your home on your windowsill. It must have been a surprise when it flew in. I don't know what I would have done. The hummingbirds are so fast. It is hard to believe that it let you capture in in your hand and let it back outside. That was good thinking on your part. I understand that hummingbirds can't go an hour without food. So the poor hummingbird probably would have died if you didn't do what you did.Still, it must have taken some courage because you probably were afraid so fragile. How did you manage to get a picture first? Now thatI think of it,you must have been extremely calm. Good for you, I wouldn't have been calm at all. Thank goodness for kind people like you. So many people don't even care about nature's creatures.